In our recent stakeholder meeting, a few participants spent time discussing the application of season extension practices to enhance crop production in the region. These practices enable crops to be grown for a longer period of time each year, increasing overall yields and spreading out income-generating periods. In these regions, light is often blamed for poor growth conditions outside of the traditional growing season, though cool temperatures are largely to blame. This is made clear when taking a global perspective. From a distant vantage can see that Wyoming falls at the same latitude as France and Italy — some of the most renown agricultural regions in the world. So how do we increase heat? Top, a temporary or semi-permanent high tunnel at Alaska Bounty Farm, in Naknek, Alaska. Yes, crops can be grown even in Alaska! Photo credit: Robert Allan. Below, a permanent glass-covered greenhouse at Wilson Farm in Massachusetts. Photo credit: John Phelan. The most common season extension relies on passive solar heating. Crops can be started or grown entirely in plastic or glass-covered structures whose transparent walls enable incoming solar energy to collect. Without the wind to carry the heat away, these structures can become hot, even in winter, helping to heat the soil in which plants are growing. 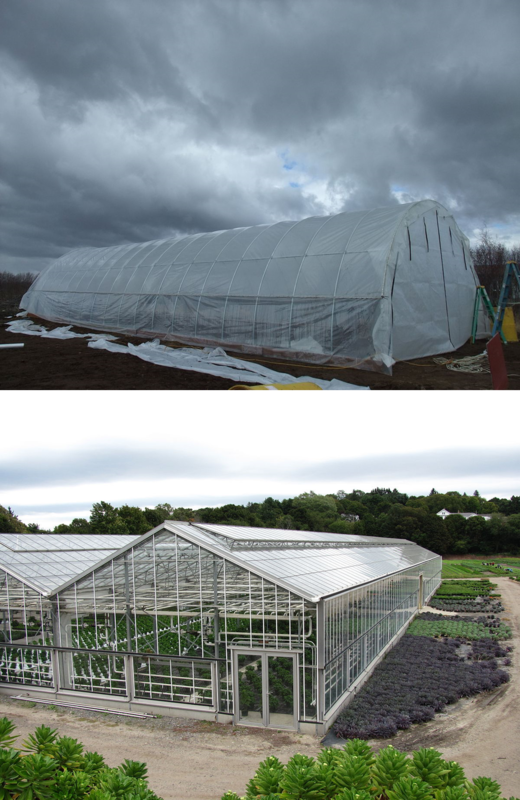 Permanent structures with glass or rigid polycarbonate panels are usually referred to as greenhouses, while temporary structures covered with thin polyethylene plastic are often referred to as high tunnels or hoop houses. High tunnels are a relatively affordable means of adding a month or two to high latitude growing seasons, and are used across the world. Below we highlight Tibetan greenhouses from a similar latitude as Wyoming. Here the Tibetans have used affordable materials and natural features to enhance productivity. The colder walls of the structure (North, East, and West) are made of sod, while the South-facing portion is exposed to the sun. The sod provides insulation from the cold and acts as a heat sink during the day. When temperatures are warm inside, the sod absorbs heat. When temperatures decline at night, the sod releases heat, helping to reduce temperature extremes. The plastic can be rolled up during summer warmth and rainy periods, and allows for managers to plow the soil inside. In addition, the plastic helps trap moisture, which can be important in water-restricted bioregions. 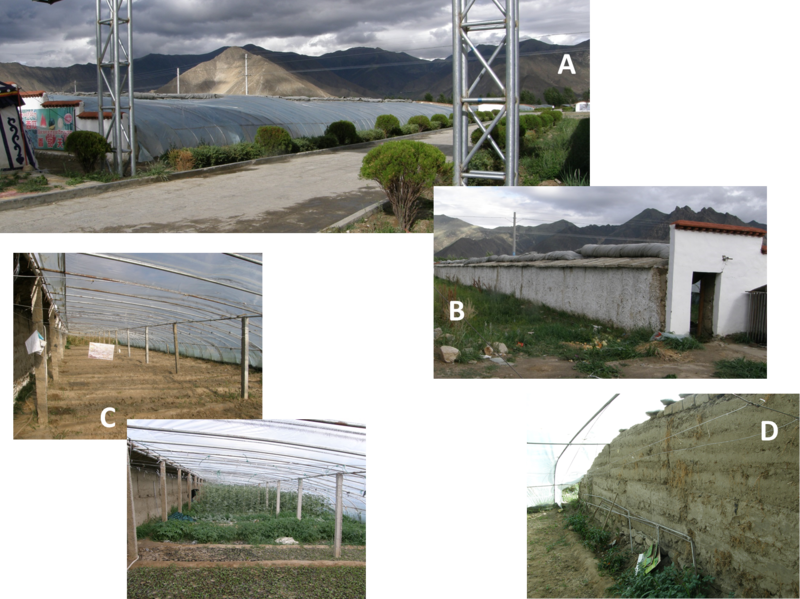 A: Front view of a Tibetan greenhouse; B: View from the back side with the plastic rolled up; C: Two views from the inside. Note the sod wall on rear (North) side of the structure; D: A side, buttress wall, also made of sod. Rear and side walls could also be made of cement blocks. The biggest drawback to use of affordable season extension is that the thin interface between the interior and exterior (often only a single sheet of plastic) means that heat is lost quickly during night time when the sun isn’t contributing its energy. Many folks install heating systems to keep internal temperatures from dropping so low that plants die, however these systems are incredibly costly. The central question therefore, is how do we increase insulation while maintaining solar gain? One approach is to use double-walled structures filled with air circulated from the greenhouse. The sun can still pass through both layers of plastic but the pillow of air between the layers acts as an insulating buffer. Eliot Coleman and Babara Damrosch, horticulturalists from Maine, have helped to revitalize interest in year-round crop production in light- and temperature-restricted regions using another approach. They have expanded the traditional greenhouse or high tunnel model by using nested structures in which they create mini hoop houses within larger high tunnels. 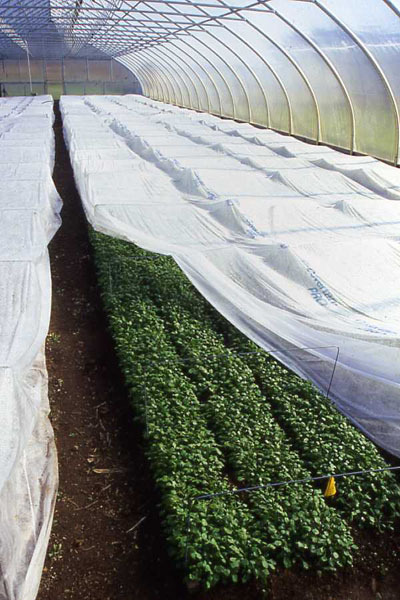 Here, the inner structures are made of fabric row cover, allowing the plants to breath, but slowing the flow of air that has been warmed by the earth, back into the upper reaches of the larger high tunnel. With careful tending they have made a thriving business growing a variety cold-tolerant salad greens and root crops 365 days a year at almost precisely the same latitude as the Ucross ranch. Coleman and Damrosch’s approach isn’t the only one out there. Do you have a novel solution that might be worth testing?